Work seems to have taken over. 12 hour days, and I'm even dreaming about it at night. Not ideal. Phil and I are finding that as we are always so busy, there is never any time to catch up with friends and family back home, watch a movie or read a book. Don't get me wrong, I love Singapore and the lifestyle, but I do miss being able to sit back, switch off and relax sometimes. We've just about managed to keep it low-key this weekend: Dinner and drinks with some girls from work on Friday, painting on Saturday, swimming and shopping today. I have to tell you about the painting. One of our friends had recommended this little interior design studio called Copper Design who open their doors for people to come along and 'Art Jam'. It's a cool little place with beautiful art, interesting lamps and lots of copper furnishings. 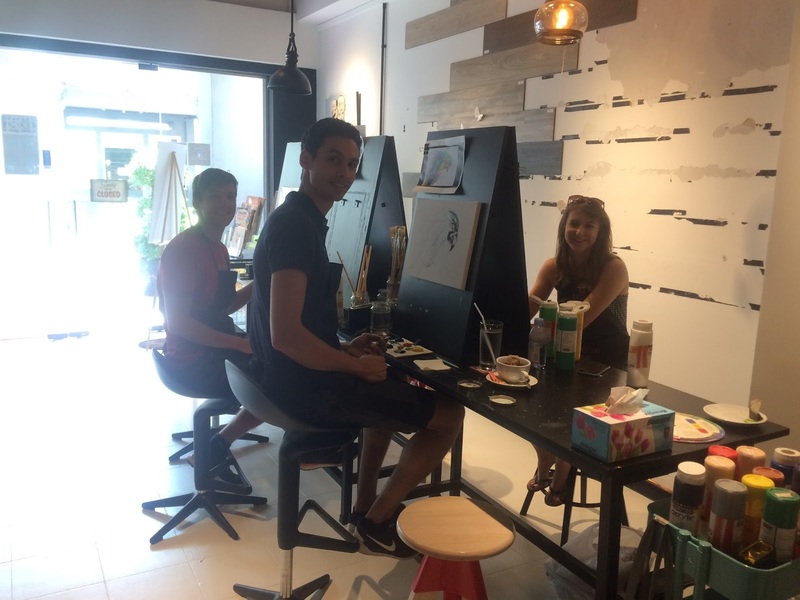 Along one side; easels, canvas, paint and brushes had been set up for us when we arrived. We were given a cup of tea, various photos/art books for inspiration and then set to it for 3 hours of painting whatever we wanted. I'm not thrilled with my painting, but hey, it was such a relaxing thing to do on a Saturday afternoon. It costs just $35 and I'll definitely be back next time I need a zen-weekend.